The best big and soft dinner rolls that my mom has been making for years. The dough is extra soft and tender thanks to the addition of butter, milk, and eggs! I’m working hard at making sure that all of my favorite recipes are up-to-date and ready for you to make. Did you know that I’ve been blogging recipes for almost 10 years (where does the time go?!)? This wonderful recipe hails from 2009 and I’ve updated it and re-shot the photos and am republishing it today so that can see it. It’s one of my all-time favorite recipes and now it’s not hiding in my archives anymore. 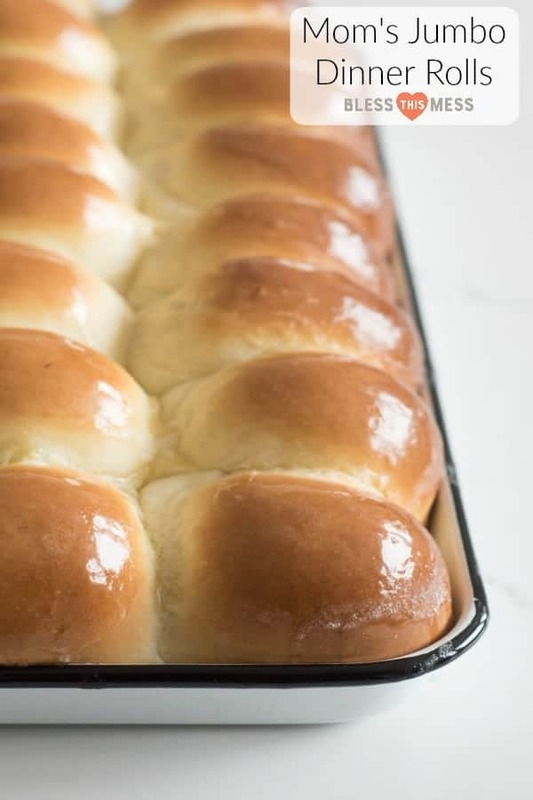 This dinner roll recipe makes big fluffy dinner rolls that your whole family will love to eat. They just turn out well every time. My mom has a handful of recipes that she’s “known for” and this, my friends, is her nearly famous dinner roll recipe. 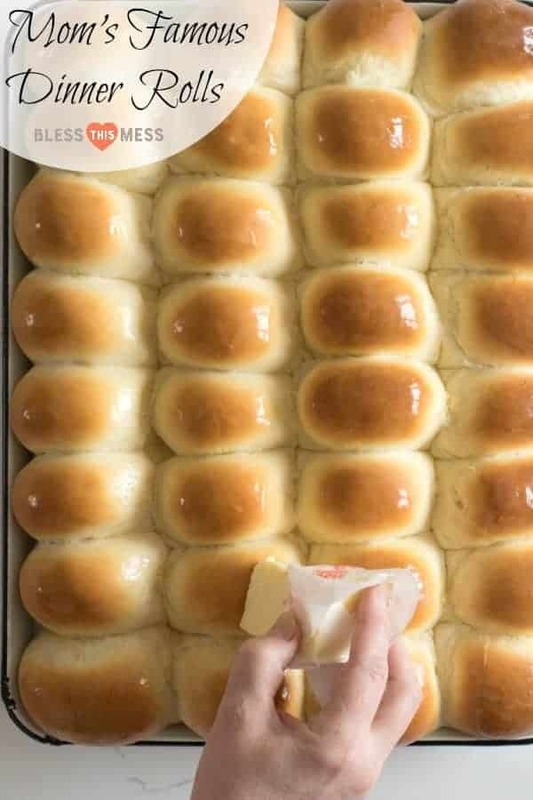 She makes it for all the major holidays and family functions, and when she flies out west to visit all the grandbabies, we always request a batch of her famous dinner rolls. They are the stuff childhood memories are made of. 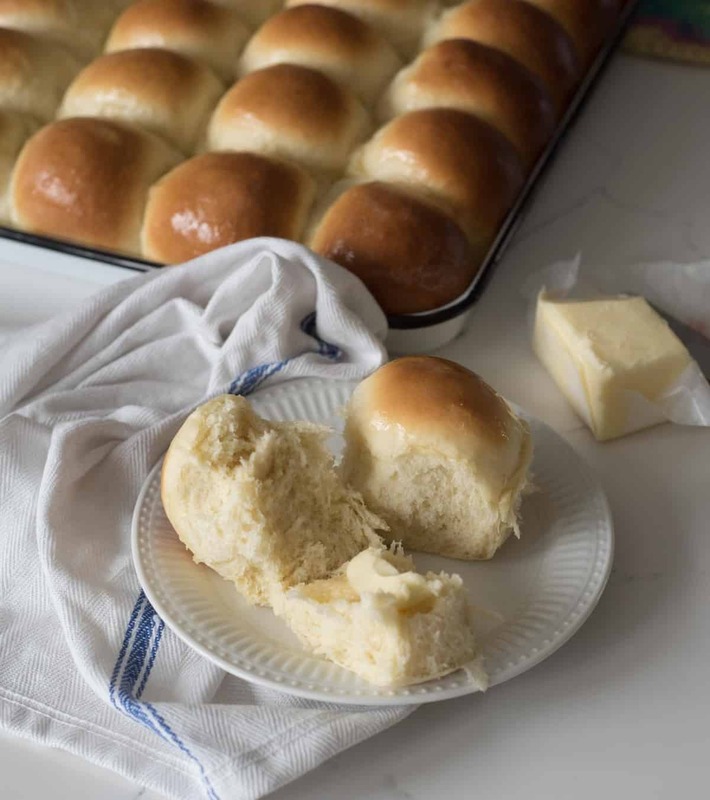 This is a classic dinner roll recipe, but the trick to make the rolls extra soft and buttery is melted butter, eggs, and milk in the dough. All three of those things lend to really tender dough. This is actually a great dough recipe for cinnamon rolls, but we’ll save that for another post. 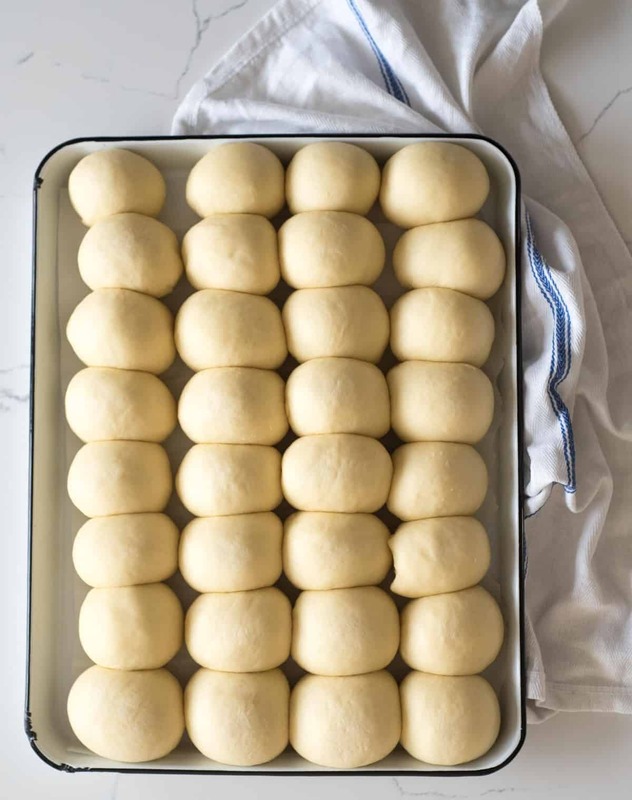 I can’t wait for these simple dinner rolls to become a family favorite in your house, too. Make sure your yeast is fresh! Check the date before starting. Old or out-of-date is the biggest culprit for failed yeast bread (more yeast tips after the next picture). This is the yeast that I use and have great success with. Don’t be afraid of over-working your dough. Kneading the dough will lead to tender and soft dough, so when in doubt, knead on! The dough should be very soft and elastic before you put it in the bowl to rise the first time. This might look like a big batch of rolls, but I promise you won’t have a problem eating them all. If it’s a few too many, feel free to wrap up cooled rolls well and and stick them in the freezer. They freeze great! Feel free to use half whole wheat flour and half all-purpose in this recipe; it works great and makes a super soft homemade wheat roll. Fill up a small measuring cup with a little warm water. Add 1/4 teaspoon of your yeast and then add a pinch of sugar and lightly stir it together. Wait for 5 minutes. If the yeast is still active you will see little bubbles along the top of the water and it will start to “foam”. I think the date on the yeast package is a good guide, and I like to store my yeast in the fridge to help keep it fresh. When in doubt, get new yeast. Nothing is worse than an unrisen loaf of bread! Heat the milk and butter together in the microwave to scald the milk and melt the butter, 2-3 minutes. Let the mixture cool for 10 minutes. In a large mixing bowl, combine milk/butter mixture, water, yeast, sugar, and salt. Let yeast rest for 5 minutes. Add half the flour and mix for 3-5 minutes. Add the eggs one at a time and mix until incorporated. Add the rest of the flour, 1/2 cup at a time, until a soft dough forms. The dough should be soft and elastic but not sticky. Knead with your mixer or by hand for 5 minutes. Let the dough rise in a greased bowl for 30 minutes. After rising time has passed, divide the dough into 32 pieces. Roll each piece into a round roll and place it on a greased, rimmed baking sheet. Once all the dough is shaped, cover the rolls and let them rise for another 30 minutes. Once the rolls have at least doubled in size, bake at 400 degrees for 14-18 minutes or until the tops are nice and golden. Remove from the oven and butter the tops of the rolls while still hot. Serve warm or at room temperature. I make this recipe using butter, but my mom often makes it using margarine. It works just great with either one. 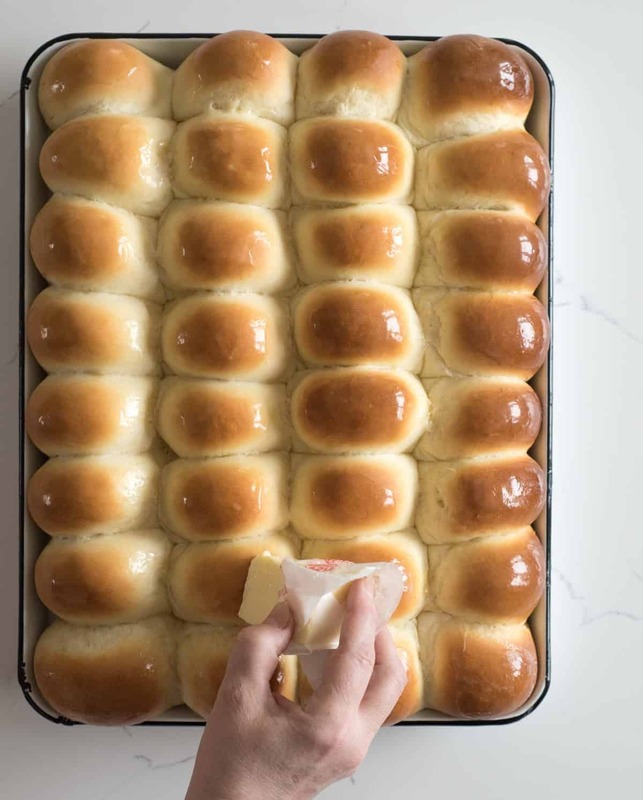 If I’m not serving the rolls right away, I like to remove them from the pan to cool about 15 minutes after they come out of the oven so that the bottoms don’t get steamy and soggy. 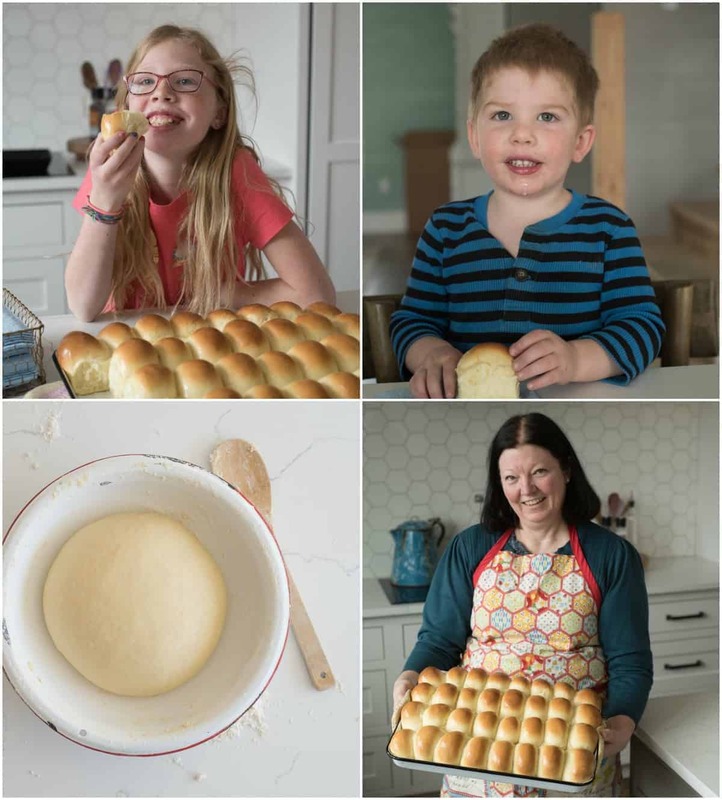 Proof is in the pudding friends – look at those happy little faces enjoying a perfect warm roll! This is a great recipe to make for any holiday or family dinner and it’s sure to make you famous in your family too! Congrats on rocking the dinner roll Kelly! I’m so glad that you all liked them as much as we do! I made these for our Easter dinner, and they turned out amazing! Thanks for sharing! 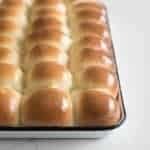 I LOVE that you made these rolls, they are so special to me and I think it’s awesome that you made them for your people too! Can you make these 2 days before eating? Yes! Just wrap them up really well in plastic wrap after they are totally cool so they don’t dry out. Great question, I should weigh it sometime for a really accurate report for you. I spoon it into a measuring cup and then level the top if that helps. I don’t sift or anything before I use it. When you say in step number 2 to let yeast rest, you mean not to stir those ingredients correct? Yep, just let it sit there a minute or two to get activated! In step 2 you say to let yeast rest, by that you mean to not mix those ingredients correct? Yes ma’am! Just let it rest a few minutes. What size is your pan? I just measured, my cookie sheets are 17.5 inches by 12.5 inches when you measure the inside. Hope that helps! There needs to be more than five stars, like 10. This is hands down the easiest,, most delicious tasting roll recipe I have ever made. I have made this recipe three times. Twice for rolls and once for cinnamon rolls. Never fails. LOVE IT! Thank you, I am currently deleting all other dinner roll recipes I have pinned. Thanks! These rolls are amazing! We’re a small family of three so we’ve been eating off my first batch for a month now. The left over went into the freezer and we just pull them out and heat them up. AMAZING! Thank you for sharing this recipe yeast rolls have plagued me for years! I love to hear that you had success! And it’s awesome that you keep them in the freezer to use as needed. Keep up the great cooking Rachel! Do you thaw them out before re-heating them? If you have time, it speeds up the process! Thank you so much mellisa all the way from Tanzania-East Africa we are using your recipes and they have been a blessing. Thank you for telling me where you are coming from! So neat to see! And Africa is so high on my travel list, so much beauty! Can you substitute regular yeast if you do not have instant and if so how do I adjust the recipe? Thanks Can’t wait to try this recipe! You can sub regular yeast for it, no changes needed.